As the weather finally starts to cool down a bit, we all start dreaming of more time outside again. You may have ignored some projects over the summer, but now is the time to refocus on your yard and outdoor entertaining. There are so many easy ways to upgrade your landscaping with decorative rock. Whitewater Rock and Supply stocks an array of the decorative landscape supplies you may need, and we can help you plan your projects as well. One of the easiest and most impactful landscape upgrades you can incorporate is simply covering an area with crushed rock or gravel. Whether a flower bed, courtyard or a side yard, crushed rock provides color and texture that creates a finished appearance. Crushed rock is available in a wide variety of colors or you can consider different sizes and textures from smooth river rock pebbles to more dramatic jagged stones. Creating more outdoor living space benefits your lifestyle and adds value to your home. If your patio area is too small, you don’t need to go through the hassle and expense of pouring concrete to enlarge the space. Using flat stones, pebbles or crushed rock is much more economical, time efficient, and is also much more attractive. The experts at Whitewater Rock and Supply can help you choose appropriate materials. 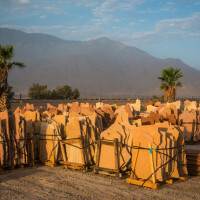 A favorite throughout the Coachella Valley is Palm Springs Gold stone, which is available as flat stones, gravel and crushed rock. If you are looking for ways to create focus points and more texture in your yard, adding boulders and rock borders is a perfect solution. Boulders can be positioned to fill in empty corners or strategically over your lawn or yard in unique clusters. Colorful rocks can also be placed to differentiate flower beds or line a patio area; create straight rock borders or curvy to emphasize your personal style. From Palm Springs Gold to Utah Green to Red Lava and more, choose from a variety of sizes, shapes and colors to enhance or upgrade your outdoor entertaining space. Just a few additions to your backyard can help to create a more inviting outdoor living space for you and your guests. Visit our rock yard at Whitewater Rock & Supply to see the extensive array of decorative landscape supplies including boulders, crushed rock and stones to upgrade your outdoor entertaining space. The range of colors and sizes will amaze you, and we deliver to Palm Springs, the entire Coachella Valley, and more. So, talk to the experts at Whitewater Rock & Supply, and we can help you choose the ideal decorative rock supply to create the perfect outdoor living space for you.